Delighting in my good girl status, we made our way to the buses for a short drive to Heidelberger Schloss, or Heidelberg Castle. The castle, dating back to 1214, was impressive, tragic, and full of love. On a hill, the former fortress had majestic views of the town and river below. What an amazing sight that Prince Elector Ruprecht III, the first to use the castle as a residence, could wake up to each morning. 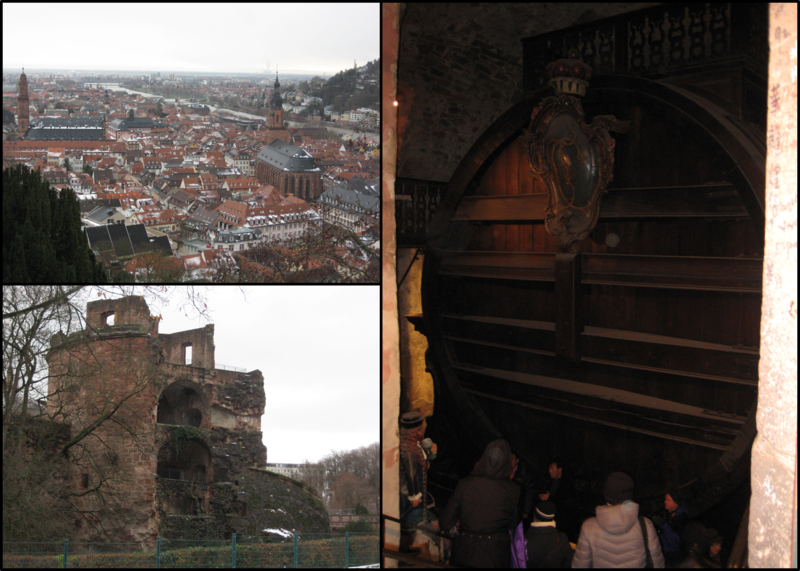 In addition to royals, the castle also housed the largest wine barrel in the world. Seriously, the thing was massive. The tragedy of the grounds was all the destruction that the castle endured during various wars. Many of the exterior walls were missing, having been obliterated, though many had been rebuilt. Yet, even in tragedy, there was love. The Elisabethentor is a beautiful carved arch that was erected by Friedrich V for his wife, Elisabeth Stuart’s birthday in 1615. Legend has it that the gate was raised overnight in the Artillery Garden much to the delight of Elisabeth when she awoke the next morning. 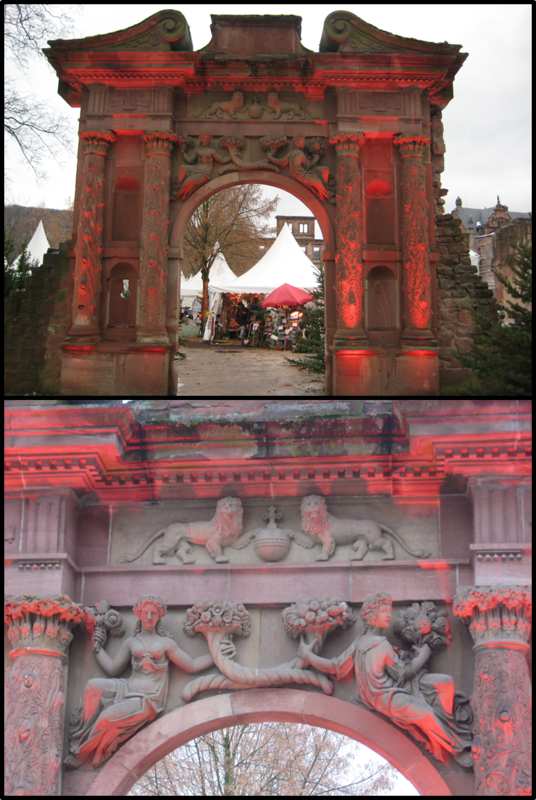 During the Christmas season, the Elisabethentor acts as the gateway to a Christmas market that resides in the garden. We bought chocolate in the shape of a cell phone as the snow fell lightly on our shoulders. 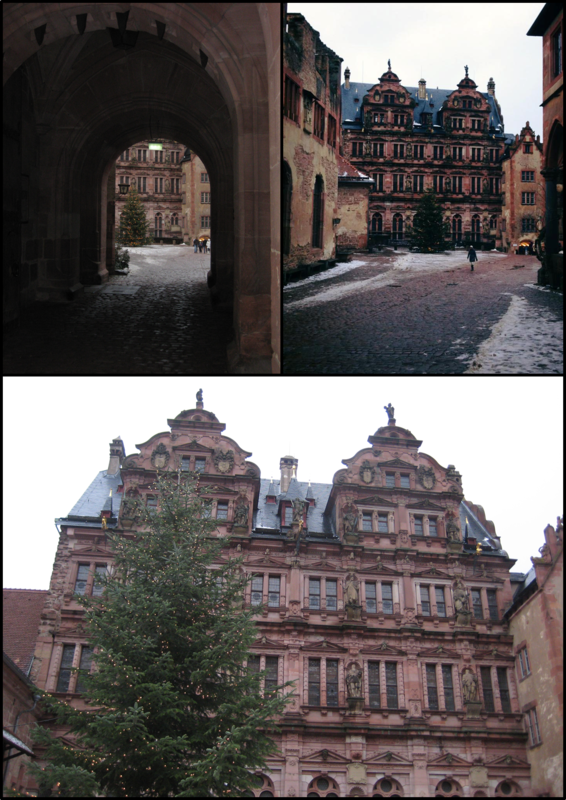 I was very excited to see Heidelberg because one of my cousins and his family had recently spent a few years stationed there at one of the local Army bases. Unfortunately, they left a few months before we got there so we didn’t have the chance to see them, but thanks to the inventions of Facebook and Smart Phones, I was able to get immediate restaurant recommendations while they were in the States. And let me tell you, the potato soup at Bier Brezel was delicious. I hope you had a good time in Heidelberg. I passed it several times when leaving for Stuttgart but never actually went there to see the castle (and the city). Perhaps the Krampus and Ruprecht are the same. Our cruise director spends most of his time in Austria so maybe that’s where the Krampus came from. Heidelberg was a great time. You’ll have to visit the castle if you every make it back there. It’s definitely worth the trip. Potato soup just sounds delicious! You have captured some stunning photos once again, and every perspective imaginable too. It makes me feel that you got the who picture from the detailed art to the sprawling cityscapes. It was really, really good, Audrey. Especially because it was cold and rainy outside. I’m glad you could delight in my habit of taking the same picture over and over from different angles. I just never want to forget any of it! It’s too bad Krampus has been downgraded to boring old coal in North America. I suppose he was too scary! I’m sure you’ll be lording that over your mom’s head for a while 😉 Beautiful shots & fun stories. Thanks for sharing! It is a shame, Rian. Though, from the stories the Cruise Director told us, it sounded like a pretty menacing character. Coal doesn’t seem so bad when a lashing is the alternative. I have heard the stoty of the Krampus but he gets no love like Santa does. Great post and amazing pictures. Such wonderful architecture! Thank you! The architecture is breathtaking. My favorite was the Elisabethenthor. The details were spectacular in person.